Every so often I get inspired to help people, and honestly I did very little in this instance. I reviewed this Kala Thin Line soprano a while ago and had the funny idea that UUBL (Ukulele Underground Biggest Loser) contest should have it as the grand prize. 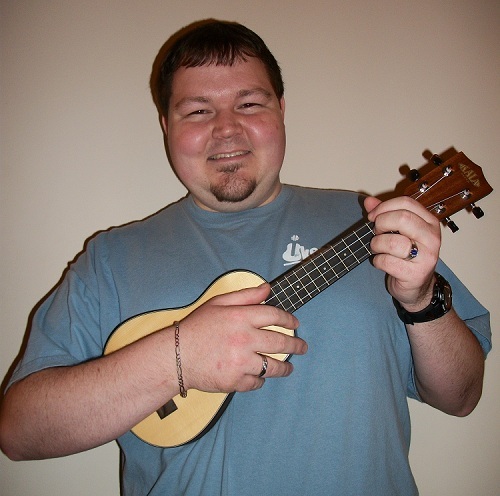 I thought it was funny that since it is thinned out uke that the ukulele player that did the same should have it. I told Kala about the contest and they thought it was great, and here we are with Andy holding his new Kala. Congrats Andy and the rest of the losers (I mean that in a good way) for losing a combined 325.9 LB!! And thank you Kala for donating it to the contest. Yes thank you so much Tim and Kala for sponsoring UUBL! I love my new Kala!!! Way to go Andy. Congratulations on both counts – losing and winning.